Brian has been entertaining and inspiring audiences as a professional speaker for more than 20 years focusing on helping others discover and maximize their own personal potential. In his spare time he has written two books, Cruisin' through Life at 35 MPH and Sending Signals. Brian is available as a keynoter and seminar leader for audiences of all shapes and sizes. Known for his high-energy presentation, engaging style and infectious sense of humor, Brian is one of the most sought after speakers in the country today. "Brian Blasko has the ability to take a group and give them the energy to transform themselves. It was a fun-filled day of learning that elevated one's professional and personal being!" Our programs are designed to awe and inspire audiences of all shapes and sizes, customized to fit your meeting goals and objectives. 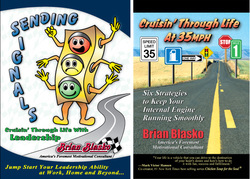 Put Brian’s strategies to work in your life found in Cruisin' Through Life™ at 35 MPH and Sending Signals.